As suggested by its name, the big tree rhododendron is a giant, reaching up to 30m in height and around 1m in diameter – the largest rhododendron in the world. Like many rhododendrons, it boasts large, attractive flowers. The tree is only known in the wild with any certainty, from the Gaoligongshan mountains in south west Yunnan, China, although there are reports that it is also found in Xizang and possibly Myanmar. Despite its size, beauty, historical and cultural significance for the local Han people, the tree is relatively little known biologically. Recent surveys conducted as part of a Global Trees Campaign project recorded 1,439 individuals at Gaoligongshan National Nature Reserve. Further surveys are needed in other areas to confirm the total population. Current taxonomy defines the tree as a distinct variety of Rhododendron protistum. However, the Global Trees Campaign surveys concluded that var. giganteum is insufficiently distinct from Rhododendron protistum and proposed that it should not be treated as a separate variety. 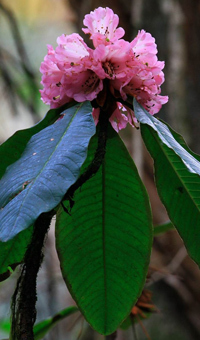 Rhododendron protistum also has a limited distribution (Xizang and Yunnan Provinces of China and Myanmar), so the tree remains of conservation concern even if its taxonomic status changes. 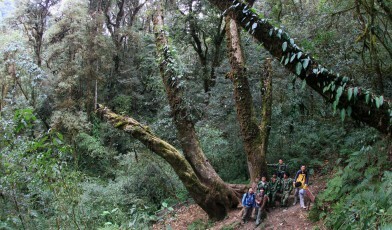 For the 2011, Red List of Rhododendrons the whole species was assessed as Near Threatened. Rhododendrons are an important group horticulturally and the big tree rhododendron is popular as an ornamental plant. The size and beauty of Rhododendron protistum may make it particularly at risk from people wishing to collect seeds and seedlings for ornamental use. Although there are signs of regeneration, seedling mortality is very high in the wild and amongst seedlings translocated to nurseries. Up to 1,000 people have been recorded as visiting some of the largest trees, and seedling trampling is thought to be a serious issue. Other threats include lightning strikes (relatively frequent because of the tree’s large size), snow damage, and erosion of the soil around their roots (because the trees usually grown on slopes).